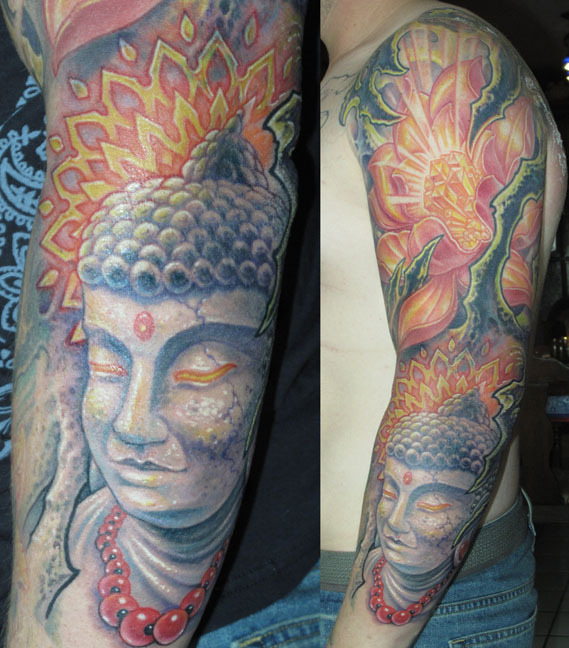 Juan Salgado, Tattoo Machines, and Sunblock! Juan Salgado just headed back home after a few days here. Juan has been dropping by regularly for work (I'm doing his left sleeve- totally biting his style in the process, but it's his arm so I can do that). He's planning on helping us with a Spanish translation of Reinventing The Tattoo- a massive project, so I wish him well on it and won't be so bold as to offer a release date- it will happen when it's ready, which could take all year. But there are so many Spanish-speaking tattooists out there doing amazing work that this makes sense for us to do. While I was tattooing Juan I turned on a video camera and conducted an interview with him for Tattoo Society Magazine... should be on the shelves in February. I usually do these interviews over the phone but enjoyed getting him under the needle for the purpose. More honest answers! 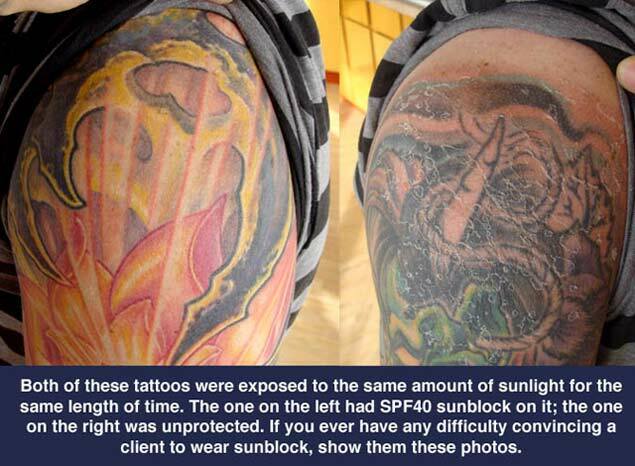 You know how we are always telling our clients to use sunblock? Well, now I have a great image that you can show them (below). Juan did a big graffiti mural in Puerto Rico a couple weeks back, and spent a big chunk of a day standing in the hot sun on a ladder. He put sunblock on the side I'm working on, but not on the other side... and you can see the difference a week later. If anyone ever gives you a hard time about sunblock, show them this! I've been playing around with a lot of different machines lately. For Juan, I did the 5 round work with a new Welker iron... I normally use aluminum machines because of my wrists, but the Welker liner has a light enough steel frame not to be a problem for me. Tramp has an interesting feature in his machines- he takes a chunk of metal out of the armature bar right where it hits the front coil core, and replaces it with a rubber plug that he calls a "silencer". So it ends up deadening about half the sound. Hard to say how it alters the machine's performance, but I'm definitely enjoying using it. Juan was convinced it hurt less than a machine without a silencer. I think this is partly because I work magnum-first most of the time, so by the time I end up using the liner the skin is already numbed pretty well with Bactine. Whatever the case may be, it's a really smooth machine. I am also using a pair of aluminum machines from Fallen King, which I'm impressed by despite the fact that they require an annoyingly stiff clipcord in order to work... small price to pay for that kind of smoothness. Still doing my 13 mag work with one of Aaron Cain's machines... still haven't found an iron that drives the big needle groups better than that one. My other workhorse machines are from Next Generation, and have given me many years of good tattooing. Anyway, have a great holiday, and I'll be updating you again soon! Juan's sleeve... we still need to do the top of the wrist and a few other things, but it's coming along.